On Saturday, I ran details of a super new Le Club AccorHotels (the Novotel, Ibis, Sofitel, Mercure etc scheme) promotion. In return for filling in a few quiz questions, you will receive 1,100 Accor points if you are a base level Classic member and 1,050 points if you are a status member. The points post instantly. If you haven’t done the quiz, follow the instructions in the article from Saturday then come back here and continue reading! Used for hotel stays, 1,100 Accor points would get you €22 of free night. 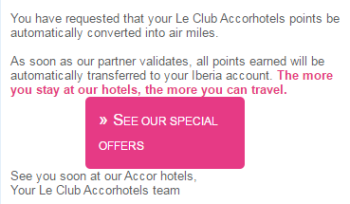 You need at least 2,000 Accor points before you can order a voucher, however. You can also convert your points into an Iberia Plus Avios account at a ratio of 1:1. 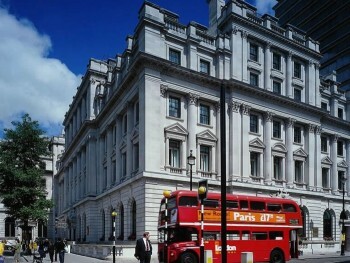 (Do not convert into British Airways as the rate is 2:1). This is meant to require a minimum conversion of 3,000 points. There used to be a way of forcing Accor to convert your existing points balance, however small. I thought it was dead. However, with the combined efforts of Head for Points commentators, we have got it working! This means – to be clear – you can now open a Le Club AccorHotels account for everyone in your family who has an Avios account and earn 1,100 Avios through it. The only ‘catch’ is that, because you cannot transfer out of Iberia Plus until your account is 90 days old, it will be three months until you can merge these points with an existing BA balance. If it has worked, you will be taken to a new Accor / Iberia Plus page which will ask you to input your Iberia Plus account number and to confirm the name on your Iberia account. If you don’t get this page, it hasn’t worked. You need to go into your Accor account, click on ‘My loyalty card’ on the profile page and turn off ‘convert to airline miles’ as it probably got activated anyway. 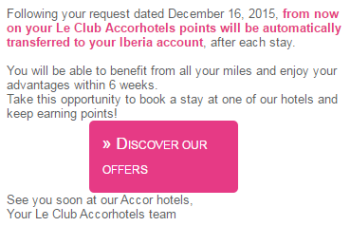 Click on the Accor / Iberia link again, perhaps in another browser (Chrome worked for me) and try again. I did for my Mum and it worked – eventually! When your conversion is set up, you receive this email. Important – if your email mentions having to earn 3,000 points before they convert, it has been set up wrongly. Your points will then appear in your Iberia account a few days later. I’m not sure how long it takes – my wife had hers auto-convert over the weekend and they have not turned up yet. You may find this all a bit fiddly, but persevere and it does work as the example above shows. Thanks for this post. I had 3000 points after the extra points for the quiz!!! Converted and got email immediately. Will have to wait and see how long it takes for it to go to my Iberia account. Also to note, it did not work on safari and struggled on internet explorer but no problem with Firefox browser. Hope that helps. Oh and thanks for the mention, Raffles! I’ve just seen this comment on another site. If true, no wonder the promotion ended so soon! Sadly sounds quite plausible – that would certainly explain the quick uptake and closure! If they’d just limited it to accounts that were already open then the loophole wouldn’t have been available! I was in Cuba when this was on so was going to do it when I got back last night only to discover it has ended. You’d hope their IT systems would pick up on the same iberia account number being used multiple times. Given how dodgy the programming is of Accor’s website (was broken for weeks if you entered your Le Club number!) I don’t have much faith that they’ll have picked this up – I suppose they might be able to suss it out retrospectively though. Oddly I’ve never had a problem with the accor website, I’ve had lots of problems with “combine my avios” on BA / Iberia / Avios, those who opened lots of accounts will have to hope that is working! I remember that one … I think I had 5 account which covered a stay in Luxembourg! Likewise. Award Wallet notified me earlier that my Accor balance had changed. Checked my Accor account and I’ve the same message. I’d done nothing to transfer those points. I’m not even sure whether I have an auto convert set up. Just got the response from Accor – all re-credited fine. Tried with several browsers (Mac), direct connection and via VPN, it never works. After I reach Iberia page, input my details and click on the button, next screen is empty. And nothing happens. What to do? I have the same problem of getting a blank screen after using our suggested link despite deactivating automatic conversion and despite trying on different devices and different browsers, but family members had theirs automatically converted. I called Customer Service and was told it was because my account was new and the others were not (none of us ever stayed at an Accor hotel). Any other suggestions for how to get my 1100 points converted to miles? Thanks. I wouldn’t believe what CS told you – as I happen to know a new a/c works fine with this method. If you find Andrew H’s first comments – not on this thread – look up the more recent Iberia threads – then you will see he linked more than 1 way of doing the auto-conversion. If you struggle to find it, I’ll have a look later but I think it’s obvious enough, just skim to his links. Then I suggest you try it all again, different browsers, different links, deactivating your preferred conversion method each time. Are you at least getting the de-activated/ re-activated conversion method emails each time? I opened a new a/c for my Mum and it worked ok.